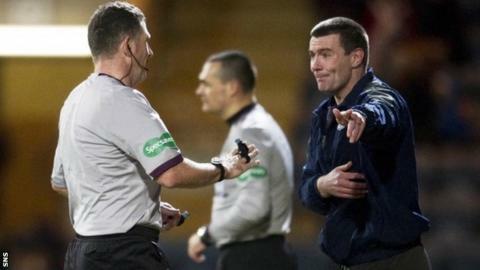 Dundee manager Barry Smith was struggling to find positive aspects in his team's performance in their 2-0 defeat by Ross County at Dens Park. "There are very few," said the dejected Dundee boss, whose side prop up the Scottish Premier League, 14 points adrift of St Mirren. "I thought Brian Easton's performance was a positive. The two young boys at the back [Declan Gallagher and Lewis Toshney] are still learning. "Other than that there is not much." Left-back Easton was one of the few players to breach the County defence but he hit his shot high over Mark Brown's crossbar from 12 yards. Smith added: "We didn't really make their keeper have any saves. "Robert [Douglas, the Dundee keeper] has had a couple of great saves. We are getting the chances but we are not making the keeper work. "It's a major problem but it's one we are doing something about. But it's not as easy as going out and getting someone who will get you 10-15 goals a season. That doesn't happen." County's goals came from Paul Lawson in 80 minutes and Gary Glen deep into injury time. Replays of the opening goal fail to show for certain whether or not the whole ball crossed the line when Lawson's shot fired down off the crossbar. "Whether it's a goal or not is irrelevant," Smith told BBC Scotland. "It's obviously worrying that we conceded the goal but it was the manner that we conceded it. "From our free-kick, they get a free-kick, take it quickly, we switched off and that's how they got up the park and scored the goal."